I'm sure a lot of people are going to knock this guy, but I like it. Sure, it's susceptible to different kill spells. However, if you are playing a deck focused on the Hellbent mechanic, this card will help you achieve your goal. Also, it's a 5 power flier. That's hard to turn down for such a cheap cost. I would expect this card to see a solid bit of play. Sometimes it's hard to pin a card down between the categories of Johnny, Timmy and Spike. 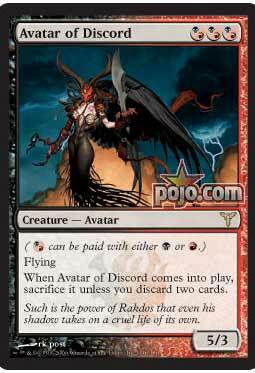 And sometimes you get a card like Avatar of Discord that just screams it's designation at you. A Spike card through and through. It has an incredibly high power to mana cost ratio. It has evasion abilities. It has an aggressive mana cost that can fit into either black or red decks. It has an ability which combines very well with the rest of the guild. Nothing like casting your Avatar of Discord to bring your Rakdos Pit-Dragon closer to Hellbent fury. Expect to see this card winning a lot of games at the prerelease, and in block constructed for the next few months. YIKES! You get a 5/3 flyer for only 3 mana! AND, it's Guild mana, so Red or Black will do, in any combination. So you have to discard 2 cards from your hand...who cares?! You get a 5 power flyer screaming at your opponent's head early in the game. Almost any opponent will have a big problem dealing with this guy, and if they don't, the game could be over very quickly. Excellent in any format! This whole week has been a powerhouse parade. This guy is a 5/3 flying for 3 mana. Yes, you have to discard two cards. It's worth it. And the hybrid mana is the icing on the cake. Just imagine getting this out on Turn 2 with a Wild Cantor. What is your opponent going to do?